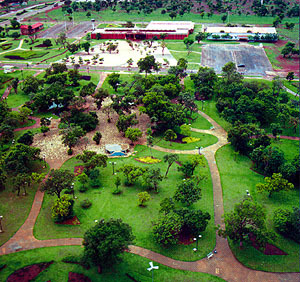 On January 1st 1990, the seat of the State Government of Tocantins was definitely established in Palmas, the new capital. 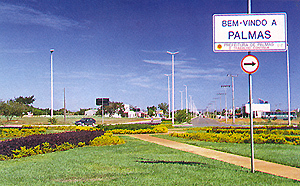 Palmas construction began on May 20th 1989. Bosque dos Pioneiros The yearly average temperature variation is between 24°C and 28°C during the rain season (Octobre-March) and 28°C and 35°C during the dry season (May-September). There is only little to moderate wind. Humidity can be as high as 80% in the wet season. Palmas has several parcs that offer some refreshment and calmness in the city that can be hot and restless. 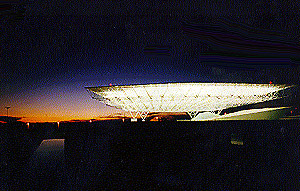 The parcs Bosque dos Pioneiros and Parque Cesamar are in the center. TO-050 (Rodovia Coluna Prestes) Palmas is located at the state geographic centre. 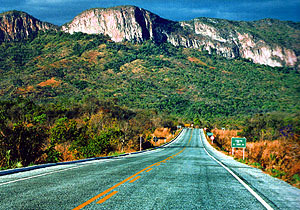 The TO-050 is the north-south highway at the east of Palmas parallel to the hills and the river. 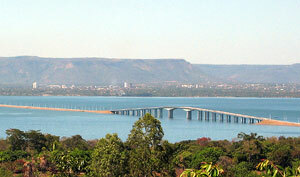 On the west side of the river is the BR153 from Brasilia to Belem, the largest road that crosses the state. 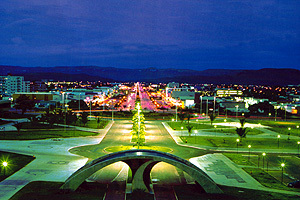 Avenida Teutonio Segurado The city enchants the visitors for its wide avenues and by landscape gardening. The first road of Palmas called after the man who strived for independency two centuries ago. 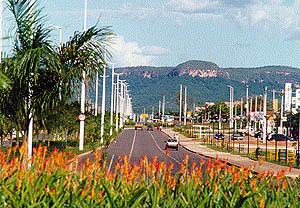 Palmas is the state capital with the largest growth rate in Brazil. With modern and outstanding city planning, it became in 20 years one of the most beautiful and well equipped cities in the northern part of Brasil. Palmas is planned for 2 million inhabitants. A view from the Serra do Lajeado. 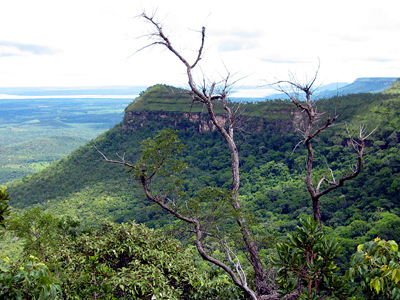 Palmas is located between these hills and the river Tocantins. the former Praia da Graciosa Besides the great hydroelectrical energy power potential, the Tocantins river provides entertainment for its beautiful beaches and landscapes. Over 2500 km of beaches and woods of astonishing beauty and plenty of wildlife. The environment is ideal for camping and fishing. Espaco Cultural The Cultural Center is located at the main road through Palmas, the Teutonia Segurado. 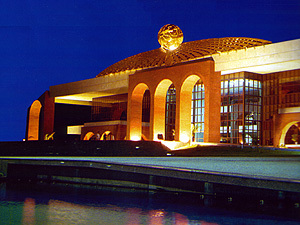 It is the main center for theatrical creativity. Large shows however are organised on the riverside and the old airport. Palacio Araguaia The Palacio has been restyled in 2001. Also the large square has been redone with mosaic and fountains. Update 2006: the golden globe has been removed after complaints that the palace was not designed that way. The city is clearly investing in gardens, squares, flower beds and parcs, to maintain its status of being one of the greenest cities of Brazil. JK (Avenida Juscelino Kubitschek) The city at night is like an illumination mirage in contrast with the calm shades of the Serra do Carmo and Serra do Lajeado slopes. The hills are east of Palmas and have a height of about 600m. The nights are much colder there. View on the JK (pronounced ´sjohta kah´) as seen from the palacio Araguaia. The most dynamic areas of commercial activities concern construction, furniture, food and drinks. Avenida Juscelino Kubitschek The JK eastside is the main street for shops and banks, while JK westside is the street where you find most hotels and restaurants. 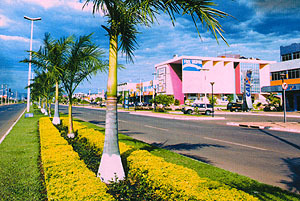 Palmas has several airconditioned shopping centers. 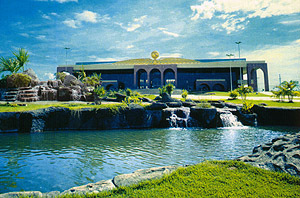 The largest is Palmas Shopping. An ideal place to cool off, have a coffee or a fast lunch. 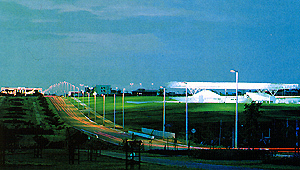 The new airport is located in the south of Palmas, near the village Taquaralto, and next to the lake. 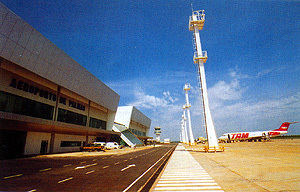 Most flights to and from Palmas are via Brasilia. It takes only a rew minutes climbing to the Serra do Carmo to be enchanted by the little village of Taquarussu. Mountain climate and trails surrounded by exuberant vegetation, many waterfalls and breathtaking cliffs. 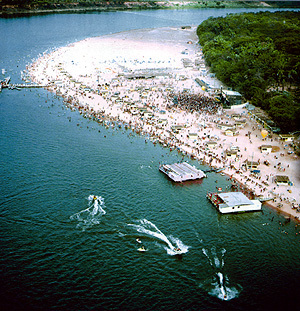 Palmas has several river beaches with sand and infrastructure. When the Orla project is finished, Palmas will have 15km of beach. 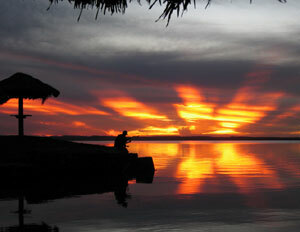 The river Tocantins has approximately 2,500 km of extension. The flow varies from 7,800 m3/s in the rain season to 780 m3/s in the dry season. A picture taken from the westside of the lake, shows clearly how beautifully Palmas is situated between the lake and the hills.